Do you want an interesting adventure? Do you want to support and motivate others? Are you interested in helping others to learn and gain qualifications? Do you want to be part of a social organisation? Do you want to get to know the people of Cape Town? … then this programme is for you! Be part of a certified community development training programme to uplift communities and create future leaders of South Africa. Sponsor one or more local participants and build lifelong friendships. Volunteer in a social organisation and actively work on social projects. Have the flexibility to enrol for anything from one month up to a year. Experience the diverse and fascinating cultural life of Cape Town. Learn.Work.Make Friends for Life is run by The Fundamentals Training Centre (FTC), a fully accredited training company that provides leadership and management programmes. For more than seven years, FTC has delivered the highest quality, needs-based training interventions to its clients, both locally and internationally. Our learning programmes have been proven to help participants achieve their personal and career goals. Who are our community participants? Those who work in community organisations are enthusiastic about contributing to community development and growth. They are passionate about breaking the cycle of poverty and inequality. Paradoxically, these are the very people who cannot afford to study further to gain the skills required to combat these social challenges. The courses chosen for this programme are targeted at South African development workers who work in Non-governmental Organisations (NGOs), Community-based Organisations (CBOs) and government (especially local government). The full qualification is called the Higher Education and Training Certificate in Development Practice. Completion of the qualification can provide participants with access to further study at higher education level e.g.at a university and/ or to gain employment. Why should you enrol in the programme? By enrolling in Learn.Work.Make Friends for Life you, the international volunteer, will automatically be giving a local participant the chance to attend courses with you. By learning together, you can share ideas and insights into your cultures and experiences. So besides learning about a thought-provoking topic, you will improve your language and intercultural skills and be exposed to experiences that few other exchange programmes can offer – a unique opportunity to make friends for life! How can you be part of a community organisation? Learn.Work.Make Friends for Life will place you in a selected organisation where you will make a concrete contribution by being part of planning and implementing a community development project. In this way you will put into practice what you have learnt from your training. We work with an extensive range of NGOs, CBOs and government departments. Your placement is guided by your interests as well as by the needs of the targeted organisation. 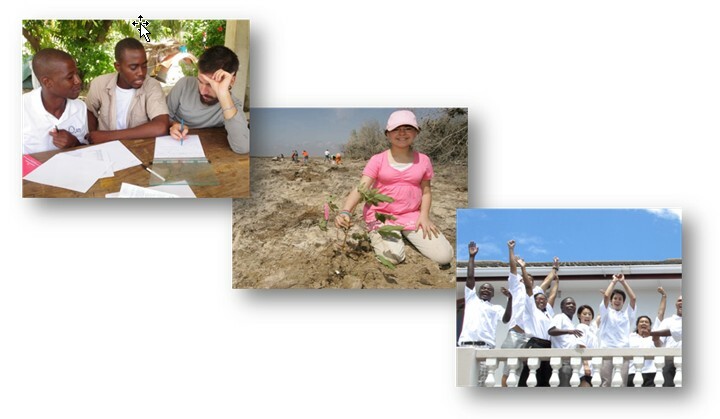 We match all our international volunteers with the most appropriate organisational environment. Close contact is maintained throughout your stay to ensure that you get the most value out of the programme. How is the programme offered? To suit the time you have to invest, Learn.Work.Make Friends for Life is offered in flexible monthly cycles. Join for a minimum of one month, or stay for further months leading to completion of the entire 12-month programme. Duration: Minimum 1 month. Extensions can be granted up to one year. Each course consists of one week of theoretical training, run at the beginning of each month. These courses are interactive and you will engage in the real issues confronting the targeted communities. The one-week training programme is followed by a three-week placement in a local organisation, where you will be given the opportunity to practically implement what you have learnt. You will work collectively with the participant(s) you have sponsored. When you sign up for this programme you are automatically exercising the option to live in a Homestay with a host family. This gives you the unique opportunity of experiencing daily life in Cape Town. All host families go through a comprehensive interview and approval process to ensure that the quality of accommodation meets our rigorous standards. Our host families live in the suburbs of Cape Town. You will have a private, furnished room and breakfast and dinner will be supplied daily. Bed linen and towels are provided and most families can also arrange to do your laundry. We cannot always guarantee that you will live within walking distance of the training centre or community organisation placement. You might need to take a bus or train to these venues. Please note that we are able to provide other accommodation options including Executive Homestays and Hotel Accommodation at extra costs. Indicate your preferred choice of accommodation on the online application form. We will communicate with you once you have exercised your preferences. The fee for Learn.Work.Make Friends for Life covers training for the international volunteer and one local participant. The amount of €1 810 includes training and placing the international volunteer in a community organisation, Homestay accommodation and airport transfers. It also provides sponsorship for one local participant covering his/ her course fees and monthly stipend (for transport and food while on the programme). Special offer: For an additional €300 per month we will be able to cover the costs of one additional participant. So for €2 110 per month you can support two local participants!